Finite Element Mesh Generation provides a concise and comprehensive guide to the application of finite element mesh generation over 2D domains, curved surfaces, and 3D space. Organised according to the geometry and dimension of the problem domains, it develops from the basic meshing algorithms to the most advanced schemes to deal with problems with specific requirements such as boundary conformity, adaptive and anisotropic elements, shape qualities, and mesh optimization. From the geometrical and the topological aspects and their associated operations and inter-relationships, each approach is vividly described and illustrated with examples. Beyond the algorithms, the book also explores the practice of using metric tensor and surface curvatures for generating anisotropic meshes on parametric space. It presents results from research including 3D anisotropic meshing, mesh generation over unbounded domains, meshing by means of intersection, re-meshing by Delaunay-ADF approach, mesh refinement and optimization, generation of hexahedral meshes, and large scale and parallel meshing, along with innovative unpublished meshing methods. The author provides illustrations of major meshing algorithms, pseudo codes, and programming codes in C++ or FORTRAN. 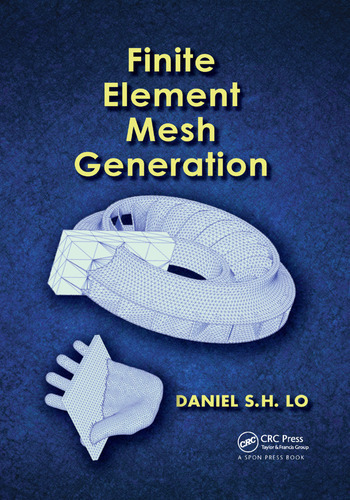 Geared toward research centers, universities, and engineering companies, Finite Element Mesh Generation describes mesh generation methods and fundamental techniques, and also serves as a valuable reference for laymen and experts alike. What is finite element mesh generation? Why finite element mesh generation? Problem definition, scope and philosophy, science or art? Daniel S.H. Lo received his Doc-Ing from L’Ecole Nationale des Ponts et Chaussees in France. He is currently a professor at the Department of Civil Engineering of the University of Hong Kong, and has been working on mesh generation for more than 30 years. Apart from numerous journal papers on mesh generation and finite element technology, Lo has also been the guest editor for two special issues on finite element mesh adaptation, co-author of a book on the finite element method, and author of book chapters on mesh generation. "… the present monograph fills a gaping hole in the literature on scientific computing… it could be subtitled by 'All you want to know about mesh generation'." "This book provides a well-structured and thorough treatment of very recent research on mesh generation, in a single well organized document. The descriptions of methods and algorithms are complete and provide readers with all the necessary information needed to implement on their own the algorithms and methods discussed in the book. Numerical examples provide concrete measures of the performance of the algorithms and can serve as a reference for those interested in validating their own implementations." "…there are very few books on this subject. Daniel Lo’s book (examining the contents) offers a practical point of view and gives details on some topics which, I think, are not cover[ed] by the other books on meshing techniques." "This book brings together the major propulsion system components with control oriented models and actuators to enable software and hardware-in-the-loop simulations. … This book will provide students with a detailed set of component models and simulation tools to learn Rapid Control Prototyping methods." "This book is aimed at those who want a comprehensive overview of the techniques of finite-element mesh generation. The techniques and algorithms are clearly explained and there are good references to follow up where greater detail is required. However, there is probably a broader readership among practising engineers, who use the finite-element method on a daily basis, and who want a better understanding of the tools they rely on as a basis for their calculations."